Happy New Year! Are you eager, worn out, hung-over, excited, or ready for summer? 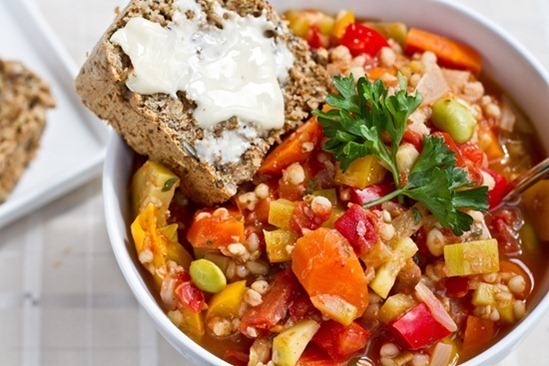 Maybe, you’re cold and looking to warm up with a soothing bowl of soup? Or maybe you’re fighting off a bit of a cold from the holiday excitement? 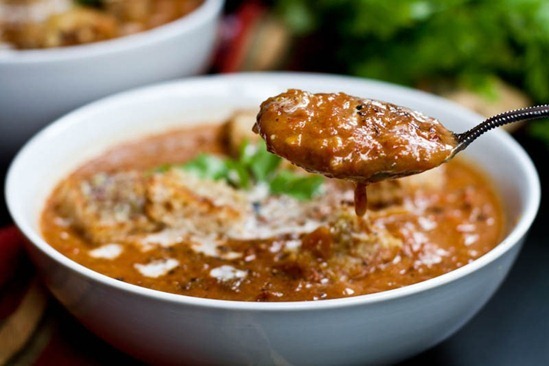 Here are the top 10 soup recipes of the year according to you. I’ll rank the soups below and then tell you my personal favourites at the end. I also suggest serving the soup with warm & crispy cornbread or cheezy garlic bread. 1. Creamy Roasted Tomato, Garlic, and Onion Soup! 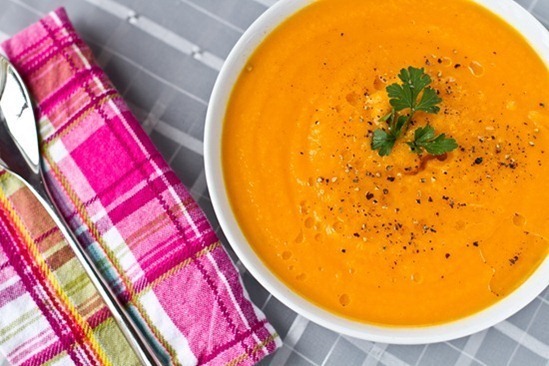 My favourite soups just so happen to be the top 4 soups plus the carrot soup! Oh how I adore the carrot soup. And the red lentil and squash stew is high up there on my list too. What about you? I’ve made both the holiday soup for the soul and the carrot apple ginger–both were AMAZING!!! I LOVE SOUP! The best homemade meal a person can make in my opinion!!! These are all amazing! These round ups are my favorite – so many things to try! Perfect timing – the weatherman just said something about single digit temps. Probably sounds like child’s play to you! LOL! I never think to make soups, they always seem like a ton of work to me, but truly they are basically a throw everything in the pot and walk away kind of meal. Gotta make more this winter!! 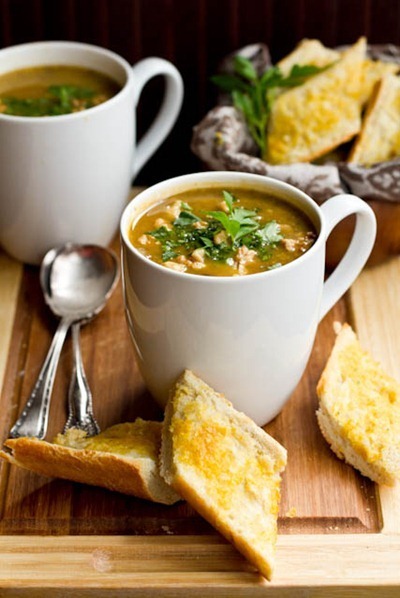 These would ALL be on my list– you just can’t beat a good soup in January!! All of your top posts have made me realize that I don’t make enough entrees for my blog! Top desserts? I could make 100 posts highlighting them all! You’re just so good at making savory food look good :) Loved that broccoli dal. Definitely my favorite! We loved your ginger soup! I can’t wait to try the others! 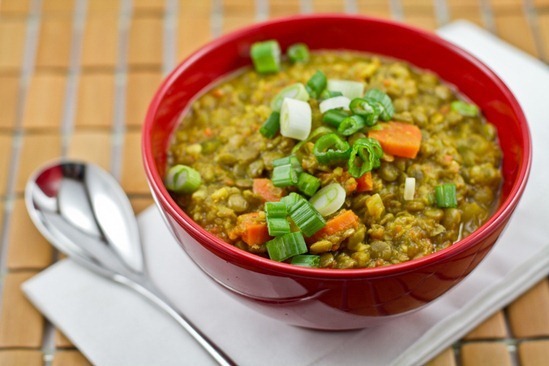 I made the curried lentil soup and loved it! I bet the others are great too. Yum! All the soups look wonderful!! I love these kind of posts! Yum, I need to try these! Well, the ones without nutritional yeast, as it’s hard to get here. How come the comments are closed on some of the entries (like that tomato soup, for example)? Is it necessary to use roma tomatoes or would any do? Hey Jessy, I think my comments close after 90 days…sorry about that! Maybe I can re-open them. I think you can use any type of tomato! the broccoli daal was sooo good it hurt my mouth. The mushroom millet soup is my fave. I’m on my third batch of it since you posted it. I use quinoa instead of millet. Going to try more of them this year. I’m bad for eating the same dishes over and over when i like them. Hey Angela, just wanted to let you know that there is some info missing in the recipe for the mushroom millet soup on your recipage. In the directions it doesn’t say when to add the mushrooms. I noticed it’s in the directions in the original post, just not on the recipage. Thanks for the great recipe though! Thanks Danielle for letting me know! I’ve corrected it in the recipage now. Thank you again! Love these! Can’t wait to try them! I am loving all of the end-of-the-year recipe lists! Perfect mini-cookbook when I need a quick idea. is it weird that MILLET is one of my favorite foods? 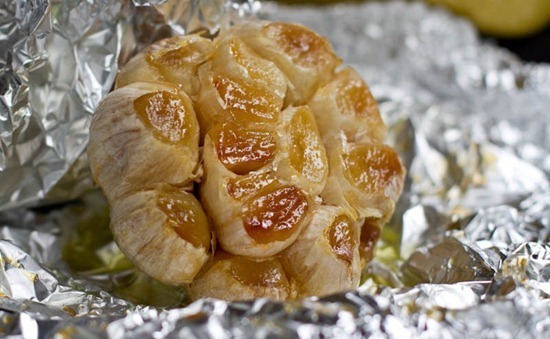 is it weird that roasted GARLIC is one of my favorite foods?! 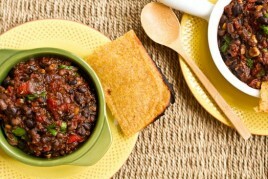 your black eyed pea chili – wins the blue ribbon in my home for awesome warm food of the season! thank you for the soup post today! perhaps January 2012 will mark an OSG 10-days soup-making-marathon month in my home too?! Yum, an entire post dedicated to your favorite soup! I love it. Happy New Year! Ooh I am so glad you did a top 10 soup recipes post! I love making soup and I have tried and loved some of the recipes above, but I had forgotten about a few. Especially the mushroom millet soup. That is now on my ‘must make’ list! Thanks for all these delicious soup recipes! I’ve made the tomato soup twice, once with in season tomatoes and once a few weeks ago. In season tomatoes are a definite must for this recipe! Do you think replacing the tomatoes with canned fire-roasted tomatoes would work? If yes, how many cans would you use? And would you drain them? Thanks again for all the delicious recipes. Your website has certainly made my transition to veganism a heck of a lot easier. Happy New Year! Thanks for the roasted garlic tutorial. Ever since I saw that on your site I’ve been making my own roasted garlic hummus every week. 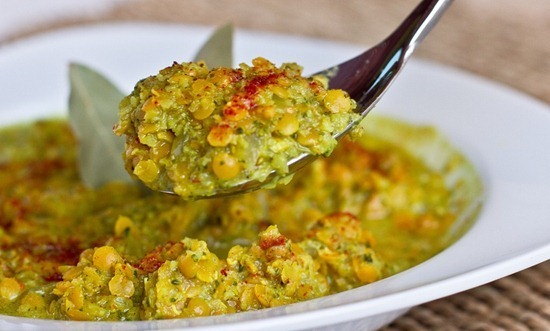 Super easy and adds so much flavor! I had a vegetarian dinner party on New Years Eve and made three of your recipes. Each was a HUGE hit! 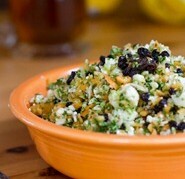 I made your hummus, kale salad and quinoa with apple and almonds etc.. I will definitely be making those recipes again!! My husband said that he finally liked kale because of that salad – and it was so pretty too!!! That’s awesome news Jolene! :) Eric said the same thing about that kale salad. And, that carrot soup you mentioned was in fact, awesome…again though made with the sweetest of summer carrots. Bummer! I love these roundups, Ange…so helpful in reminding me re. winners I might have not yet tried. Thanks! Karen, I was thinking the exact same thing about the roasted tomato soup yesterday! It will be one of the first things I made late august! sauce, which complemented the flavor perfectly! I added some fresh thyme too. LOVED the results, and loved the simplicity and minimal ingredients. Next time, I may swith it up it with barley or wild rice for the whole grain. Last year I recall you writing that you would announce big news at the end of 2011. Did I miss that? If so I am sorry and if so can someone fill me in? Nope you didn’t miss it! It just didn’t happen yet…doh! Thank you for putting these all together on one page, Angela! I recently decided to make a big batch of soup each weekend to have on hand during the week for a quick and healthy meal. I can’t wait to give each of these a try! Also, I just wanted to let anyone who might read this know that I am doing a New Year’s give away and am offering FREE 3-month holistic health coaching programs to the first 3 ladies to sign up! If you’re interested, head over to my website now and claim your spot! Just when I was feeling like cooking up a big pot of soup tonight, this post pops up! I can’t wait to make one. PS- your pictures are glorious! one of each please! HAPPY NEW YEAR ANG! Ahhhh, gorgeous soups my friend….I never, well rarely make soup! I find it never keeps me full. WTF?! Right?? Maybe I’m not making them as hearty, stick to the ribs as yours are! Forget it, I’m just coming to live in your front yard…will you please feed me everything? I made your holiday soup for the soul, and it was absolutely delish! I can’t believe that I haven’t tried any of these recipes! Thanks for putting them all together so now I can choose one to try – hmm, which one first? They all look so good! What a great post, mmm soup! 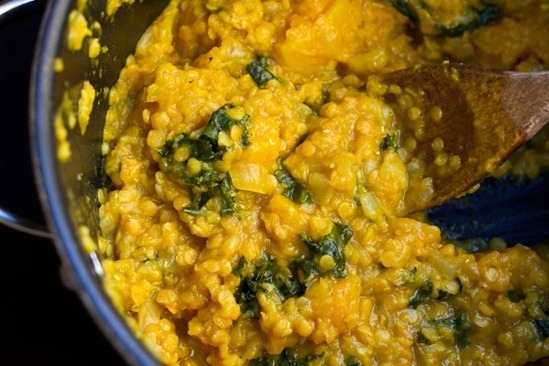 I have already had the red lentil and squash stew and am making the millet and mushroom soup tonight for dinner. 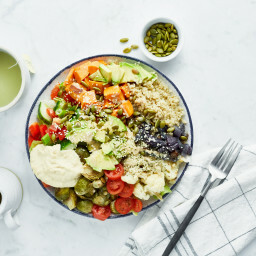 Just bought red quinoa recently and wasnt sure what to do with it – now i cant wait to try holiday soup for the soul, it looks so pretty. 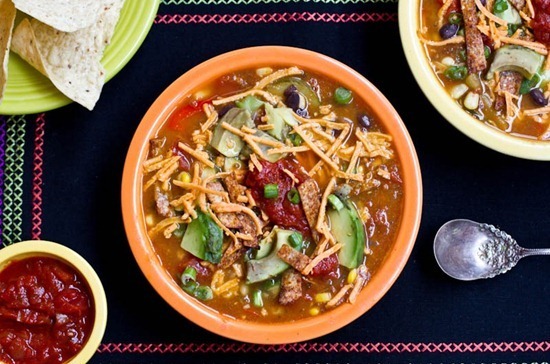 I made your tortilla soup this year and both me and my mom loved it! I can’t decide which one I want to try next – they all look so good! Happy New Year Angela!! I absolutely adore your blog. It’s so colourful and friendly and full of simple, healthy recipes. Thank you very much for your creativity and generosity. I hope this new year is full of unprecedented blessings for you and yours. Thanks for doing these lists! it’s so easy to forget about all the great recipes you post all year long. We just had Holiday Soup for the Soul with brown rice instead of quinoa and no canned tomatoes (just not a fan of canned tomatoes). Wowww! The curry and saffron really make the dish. Great soup! I’m sure that my visiting the red lentil and squash curry stew contributed to its popularity in 2011 – I swear I made it at least once a week. It is my absolute favorite and I’m sure at least half of the hits come from me or people I’ve recommended it to! I can’t wait to see what you have in store for 2012! I made them yesterday too! I always forget how much I love them. So fluffy! I just want to thank you for all your efforts and for all the information you share. I also do a blog, which by now means compares to yours, and I appreciate the time that is involved to blog. You do a fantastic job. I am a relatively new vegan – about a year and a half – so I am always looking for recipes. I have made many of yours. One of my most favorites is your Overnight Oats – that one is brilliant! On my blog today I wrote about your blog and your soups. I hope my readers all come visit you. They will be so happy they did! hank you Kathy that means so much to me! The soups look great on your blog by the way. :) Enjoy! Hi Angela – I have a strong tomatoe allergy. Any ideas on substituting canned tomatoes in some of these wonderful recipes? The holiday soup in particular has my taste buds in a frenzy. Thank you for your wonderful gifts of fantastic, beautiful, alkalizing vegan foods! Hi Emily! Sorry for the delay in reply. I don’t know of a substitute, but I do recall seeing a tomato free pasta sauce recipe in the vegan cookbook call Blissful Bites. Maybe you could check that out and see how they did it? I think I recall they used squash and carrots in addition to a bunch of seasonings, vinegar, etc. Perfect timing with this COLD snowmageddon! I must say I’ve never been too convinced that I could ever become a vegan or vegetarian until I started reading your blog, you truly cook the most amazing recipes, thank you for the inspiration! While shopping at Whole Foods yesterday, I strolled down the soup aisle and told my husband to pick a few out. Then I stopped myself and said “nevermind- we will MAKE soup.” I don’t know why I ever buy canned soup- it’s so easy to throw a few things in a crockpot and let it go! 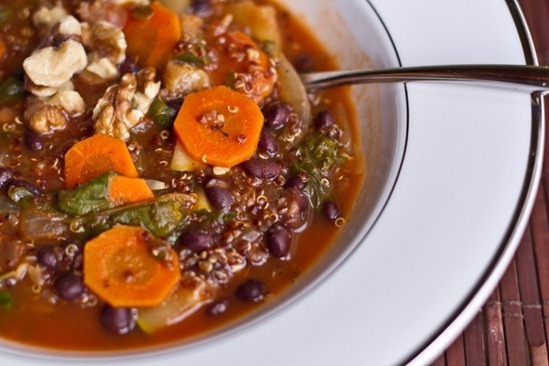 I immediately clicked on the husband healing soup- it looks so beautiful! I have most of the ingredients- including some frozen edamame that I bought yesterday. Yes! Very ready to start making homemade soups for lunches so these are much appreciated! I made the roasted tomato garlic and onion soup last year. I have a big ol squash in my fridge that needs to be dealt with so I will probably make the curry stew with it. I have a bunch of french lentils in my cabinet. Are they a good sub for the red ones in these recipes? I currently have the curried lental soup on the stove. It’s about 15 minutes from being done and I can hardly wait it smells absolutely delicious. Perfect for getting me out of my cranky, rainy day(year) funk here in Prince Rupert. Lunch, here we come!!! Oh I am glowing, that tomato soup was sooooo good! Thanks for sharing! I can’t wait to try the mushroom soup!! 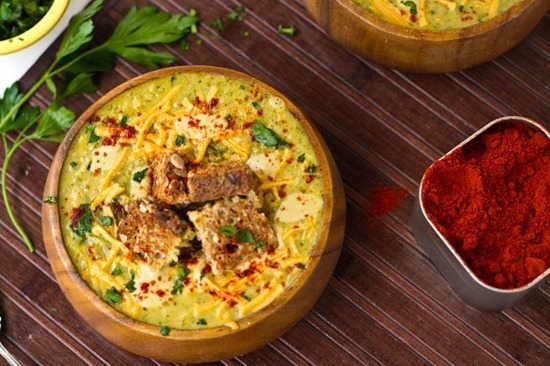 Thanks for this post-I’ve been craving soups! I made the Broccoli and Cheeze soup last night for dinner (got a rave review from my husband!) and then brought the leftovers in for lunch, my ENTIRE faculty room now has your website after tons of comments about how good it looked! I’ve been following your blog for a while, I love it!! I’ve made so many of your recipes and they have all been amazing, thank you! I was inspired to make the roasted tomato/garlic/onion soup a couple of nights ago! I had a bit of a hard time reading the recipe on my tiny phone screen in the grocery store, so I accidentally used almost the entire 5 lbs of tomatoes in the soup… and we were out of tomato paste and garam masala, so I improvised with a few tablespoons of a red curry paste my roommate had in the fridge, which tasted amazing with the coconut milk, and some paprika and chile powder. It ended up being a far different, more tomato-y animal than the original recipe, and made maybe 8 cups of leftovers with that many tomatoes, but delicious nonetheless! I made the Holiday Soup for the Soul this week and had it for lunches all week at work. It was delicious. 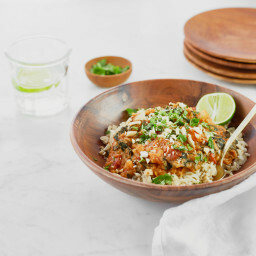 We’re making the curry red lentil stew tonight for dinner. Thanks for all the great recipes and helping us get our year off to a healthy start! The cauliflower soup recipe has dissapeared! :( Migrated to a cooking book? I don’t remember this recipe, I don’t think it is mine. Maybe you were thinking of a different blog? I tried searching in my archives and nothing came up.